Happy Monday everyone! What do you have planned this week? I am trying to get caught up with everything I can so that I can take off Wednesday for NYC!!! 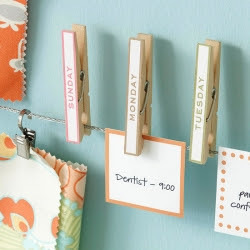 I thought you'd like this clever (and cute) idea for organizing your week! Check out more fun household organizational tips at Rebecca's Soap Deli News here! My favorite is #2. What is yours? Hmmm... that is really a cute way to get organized. Hi Sherri and thanks so much for popping over - twice! I've got some intense organising to do because we're off to spend two weeks in the Highlands and Islands of bonny Scotland on friday, yeah! And I like the fridge organising tip the best - I used to do this, and it was/IS very necessary with a tiny under-the-counter fridge. So Sherri, here's a question: how come bad habits are so hard to break yet good habits drop by the wayside soooo easily. And then seem to vanish from memory without a prompt from someoneelse? I wonder what other gems I don't remember haha!!! "Hillsong" that titles "inside out" living for God. You probably already know this. Enjoyed your blog and I'm your newest follower! what a cute idea! Don't we all need help in this area at some point or another! I know I dO! NYC, how fun! Have a great trip! So cute! Have a wonderful time in NYC! This is darling! Have a great time in NYC! Wish I was going too.